Courage redefined is a prevailing theme at this year's Berlinale. Or perhaps I'm noticing it more in films as I search for my own definition of the word, and the quality. Courage being what is needed in uncertain times and I don't mean the kind that turns men into heroes. Those are burst of courage, while I am seeking the long distance run, garden variety kind of braveness that can be sustained throughout this baffling moment in our world history. Along with music, art, film and incredibly touching performances by some world-class actors, I've also discovered true grit at Berlinale. 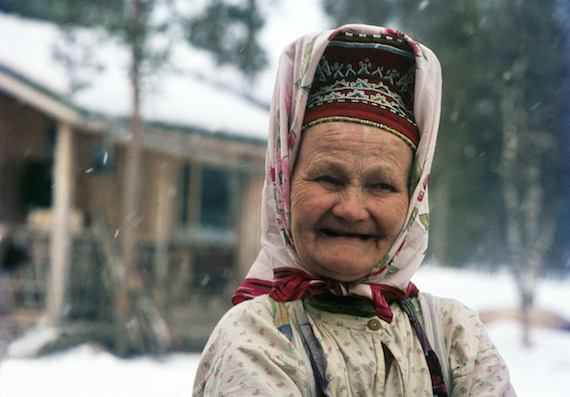 Filmmaker Katja Gauriloff hails from Lapland and she is a proud descendant of Finland's indigenous Skolt Sami tribe. In her latest film Kaisa's Enchanted Forest, Gauriloff -- beautifully and poetically -- explores her roots, through stories about her great-grandmother Kaisa, as told in the travel writing of the Swiss Robert Crottet and the images of Spanish photographer Enrique Mendez. In person Katja is the younger, modern splitting image of her great-grandmother, possessing all the quiet courage of her ancestor, as well as her hauntingly beautiful eyes. Eyes that tell a story of displacement post-WWII at the hands of both the Russians and the Finnish government. Eyes that through displacement have found a resilience within. Lets face it, indigenous people the world over have always suffered and will continue to suffer until we mobilize to stop the worldwide injustice instead of concentrating on the "cause célèbre" of the day. When people hold up banners that say "Refugees Welcome!" I think, well, where are you when Native lands are torn away from the very people who have owned them for hundreds, perhaps thousands of years? Where is the public outrage for those who lost and continue to lose their home? Saving the world begins by saving just one person -- start with your neighbor. The refugee crisis is caused by a wave of displacement, so the logical solution is helping a person, a family, a people to find stability in their homeland, before that crisis begins. Gauriloff's film provided me with one new definition of courage found within the idea of resilience, but also friendship and cultural bridge-building. Kaisa's story has been told because of Crotter's writing and Mendez's images, and without that lifetime friendship we would have never been able to cherish this beautiful work of cinematic art. Kaisa's Enchanted Forest screens in the NATIVe program. From Finland to India, to the jungle of Chhattisgarh in Central India to be exact. Newton by Amit V. Masurkar is a touching, personal and very human film about the strength of one very resolute rookie election clerk to uphold the democratic process in a rebel-threatened area. The title character, played by the charismatic beyond belief (both on the screen and in person) Rajkummar Rao, fights so powerfully and persistently to allow a village of barely 70 inhabitants to vote that his efforts become farcical. And magically cinematic in the process. Newton as a man is another impersonation of courage. Rao plays him straightforward and nearly monotone and somehow manages to weave within that a romantic hero-like quality. But characters that shine beyond their role in society is a specialty of the Shahid award-winning actor. Masurkar is also a master at downplaying, which of course only exalts the audience, able to draw its own conclusions. There are lots of funny moments in Newton but its true beauty lies in the burst of human truths it tells so powerfully, and the characters surrounding the story which are well-rounded and honestly played. I wouldn't be surprised if the film made a big splash around the world, at this time when we're perhaps no longer taking democracy for granted. Newton screens in the Forum section. We often forget that the reason we love cinema today is because our parents showed us movies when we were children. And every once in a while, I find I need to reconnect to stories that talk about the world from the viewpoint of kids. 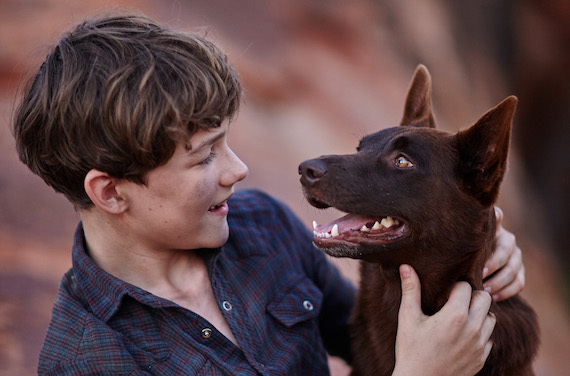 Red Dog: True Blue is a wonderful new Australian film that did just that for me, brought me back to my childhood years. But to call it a children's film would be doing filmmaker Kriv Stenders an injustice because it is pure true family entertainment and a movie everyone can agree to watch together, the young and old, the pure and the jaded. Based on the legend of Red Dog, and on the writing of Daniel Taplitz, who also penned the original Red Dog film, this installment is more of an origins tale than a sequel. In fact, it tells the story of young Mick who is shipped off to his grandfather's cattle station in Western Australia and there finds a connection with a wolf-like strange dog he calls Blue. Actually, at times Blue, especially when the camera closes in on his eyes, looks eerily like the Berlinale bear! But I digress. Red Dog: True Blue is also a tale that encourages reconnecting to the inner child, to find serenity in life. I loved hearing stories about the screening of the film in Berlin from both the filmmaker, his lead actor Jason Isaacs (who plays Mick as an adult) and their publicist. The excitement was palpable and there is no better -- and more honest -- audience than one filled with children. They won't let you get away with anything less than perfectly wonderful. Which of course, this film is. Red Dog: True Blue screens in Generation Kplus. As someone who grew up watching The Love Boat on TV, a film that talks about an all-male gay cruise ship sailing through a sea of fun and human stories sounds like a dream project. And when I finally watched Dream Boat, I found within its poignancy and truthful story a real gem. Tristan Ferland Milewski weaves a portrait of homosexual men who are all searching for their very own, personal definition of love. Dipankar, an account manager from India but living in Dubai yearns for normalcy in a gay relationship, while Martin, a photographer from Vienna living with HIV finds comfort in a more flamboyant lifestyle. Ramzi, a student from Palestine, has found a haven and a lifelong partner he stands by through thick and thin by relocating to Belgium, while the Polish fitness trainer Marek seems more alienated after moving to Nottingham and takes his sadness on the cruise. All the while, accountant Philippe from France watches it all serenely from his wheelchair. There is a lot to adore about Dream Boat, its truthful telling of these men's tales but also the way they are photographed at their best, and sometimes at their most demoralized. For me, the true genius of Milewski's film lies in the way he singlehandedly destroys the differences that we think divide the heterosexual experience from those of the members of the LGBT community. In Dream Boat he shows us once and for all that each of us needs, craves and wants the same thing: Someone to love us, for exactly who we are. Dream Boat is part of the Panorama Dokumente section. In May of 2014 Ukrainian filmmaker Oleg Sentsov was arrested by Russian authorities for suspected terrorist activity. Today, he is serving a 20-year sentence in a Siberian jail. But his crime isn't that for which he's been convicted. He is being punished for never recognizing the illegal annexation of Crimea by Russia in 2014, for providing aid during the Crimean crisis, and for participating in the AutoMaidan movement. His lawyers, his family and his supporters worldwide know this to be the truth. Now audience at the Berlinale will be able to make up their own mind and perhaps find their own answers in The Trial: The State of Russia vs Oleg Sentsov, a documentary about Sentsov's trial by Uzbeki-Russian director Askold Kurov. The Trial is perhaps the most important piece of filmmaking you could watch at Berlinale, because it provides a dramatic, yet traumatically real glimpse into how far a dictatorship will go to eliminate courage. Courage in this case is art, and Sentsov seems like a really unfortunate scapegoat of the times. It is probably his visibility, unlike we usually see in political thrillers, that messed him up and caused his incarceration. He was visible, he was worldly, the filmmaking community adored and admired him, and this was a threat to an unfair policy. The Trial follows the everyday life of the court appearances by Sentsov himself but also the lives of those around him. His kids, his mother and his cousin, who all suffer through the uncertainty and the injustice. Unfairly accused, riddled with the lies thrown at him, Sentsov breaks out in laughter when the verdict is read, perhaps forever redefining true courage for me. 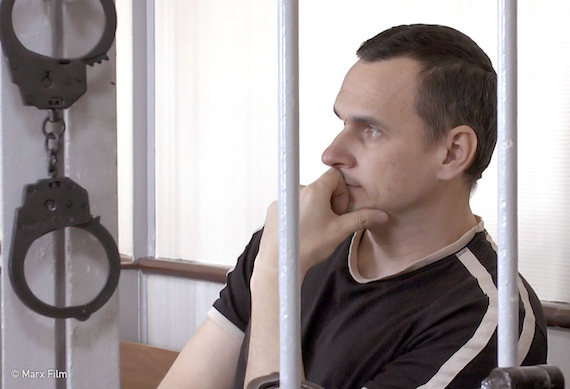 The Trial: The State of Russia vs Oleg Sentsov is screening as a Berlinale Special. All photos courtesy of the Berlinale, used with permission.